Here is another GED Math practice test that allows the use of a calculator. The majority of the GED 2014 Math questions do allow the use of a calculator. As you work through these problems, be sure to review the explanations for any wrong answers. It is very important to learn from your mistakes! Directions: Solve each problem and select the best answer. You may use your calculator. You may also refer to the GED Formula Sheet as needed. At a local yoga studio, 80% of the members are women and 20% of the members are men. The average age of the women is 30 and the average age of the men is 40. What is the average age of all the members? This is a weighted average problem, in which the average age of the women carries a weight of 80% and the average age of the men carries a weight of 20%. The combined average age will be the sum of the contribution of each group; which is found by multiplying the group’s average by its weight. Notice that this combined average is between the average age of the women (30) and the average age of the men (40), which makes sense because both groups are contributing to the overall average. 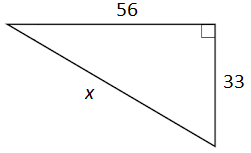 Calculate the value of x for the right triangle shown below. The Pythagorean theorem can be used to find the missing segment of a right triangle. This is one of the formulas given on the GED Formula Sheet. The theorem relates the legs of a right triangle to its hypotenuse as a² + b² = c², where a and b are the legs and c is the hypotenuse. The hypotenuse is the longest side in a right triangle and is always opposite the right angle. Each player on the high school football team has been weighed, and the data are shown in the box-and-whisker plot below. Based on this box-and-whisker plot, which of the following statements is accurate? The heaviest player weighs 300 lbs. One-fourth of the players weigh less than 200 lbs. The median player weighs 245 lbs. The lightest player weighs 200 lbs. In this example, the minimum value represents the lightest player on the team and the maximum value represents the heaviest player on the team. The median value is the player who is at the midpoint of the distribution. The quartile values divide the distribution into fourths. Since the lower quartile is at 200, it is accurate to say that one-fourth of the players weigh less than 200 lbs. Each time they play a game there is a 90% chance that the Blue Comets soccer team will score the first goal. What is the probability of the Blue Comets scoring the first goal in 4 straight games? First recognize that the probability of the Blue Comets scoring the first goal in any single game is 90% regardless of whether they score first in any other game. This indicates that scoring first in consecutive games are independent events. To find the probability of consecutive independent events occurring, calculate the product of their probabilities. 0.9 * 0.9 * 0.9 * 0.9 = 0.6561, which rounds to 0.656. Calculate the surface area of this soup can. The height of the can is 6 inches and the diameter of the lid is 3 inches. Charlie lives halfway between Chicago and Hoopertown. Amanda lives halfway between Charlie and Chicago. Raymond lives between Charlie and Hoopertown. All three houses lie on a straight line from Chicago to Hoopertown. If Raymond lives 15 miles from Amanda and 23 miles from Chicago, how far does he live from Hoopertown? Draw a diagram, and label all of the given information to help you solve this problem. Use the provided relationships to solve for the unknown distances. The given information tells us that Raymond lives 15 miles from Amanda and 23 miles from Chicago. Subtract these quantities to find the distance from Amanda’s house to Chicago: 23 − 15 = 8 miles. Amanda lives halfway between Charlie and Chicago, so the distance between her house and Charlie’s is 8 miles. The distance from Charlie’s house to Chicago is 8 + 8 = 16 miles. If Charlie lives 16 miles from Chicago and Raymond lives 23 miles from Chicago, then the distance between their houses must be 23 − 16 = 7. Since Charlie’s house is equidistant from Chicago and Hoopertown, the distance from Charlie’s to Hoopertown must also be 16 miles. Raymond lives 7 miles from Charlie so the distance from Raymond’s house to Hoopertown is 16 − 7 = 9 miles. Which of the following equations represents y in terms of x for all ordered pairs listed? If x is a small negative integer and y is a large positive integer, which of the following expressions must be positive? Before considering the answer choices, recall the properties of positive and negative integers. Both multiplication and division of a positive integer with a negative integer always yield a negative integer. Consequently, the only possible answer choice that must be positive is y − x. An alternative solution is choosing a small negative integer for x, −1, and a large positive integer for y, 100, and substituting these values into each of the answer choices. Li wants to buy as many bags of mulch as possible with his $305, and he would like them to be delivered to his house. The cost is $7.50 per bag and there is a $35.75 delivery charge. The mulch is only sold in full bags. How many bags can Li buy? $305 − $35.75 = $269.25. $269.25 ÷ $7.50 = 35.9 bags. However, the question states that the mulch can only be sold in full bags, so we must round our answer down to ensure that Li does not exceed his budget.